Breaking the Pain Cycle debunks the junk and settles the contradicting opinions your hearing and gives you a simple step-by-step process to confidently and safely work towards lasting relief. – Be confident and feel safe working towards finding relief. – Understand WHY your flair ups are so random and unpredictable and learn the proper steps to take to gain more control. – Stop taking shots in the dark with what you find on YouTube or Google. – Understand why the massages, adjustments, needles and therapy sessions ARE NOT ENOUGH to see lasting relief and gain confidence in knowing that what your doing is the best first step. After living with chronic pain for over 4 years, I felt completely hopeless. Almost a decade ago, the finest spine specialist in my area sat me down and briefly explained that the disc between the L5-S1 vertebra had ruptured and that I was showing sign of degeneration in my lower back. The only thing I knew to say was…well, what does that mean? He went on to tell me how my fitness career and exercise regimen would be severely hindered and that having the discs fused together along with a few rounds of steroid shots were my best option. Fueled by anger and frustration I spent the next 4 years of my life blindly throwing treatments at my lower back spending thousands of dollars of my own money getting 2nd and 3rd opinions, Physical Therapy, MRI’s, Chiropractic adjustments, massages, you name it my back has seen it. All for nothing. Despite who I saw, I was always left with a few ways to achieve short-term relief. -Let’s talk about how your life isn’t over, this is just a minor setback that can be addressed with the right steps. Instead, he shook my hand and sent me on my way. This 7-minute meeting with him literally changed my life. I spent the next few years depressed, frustrated and feeling like I had lost all control. The worst part about it, I was in what I thought was the best shape of my life. This experience along with working with people just like you who wake up every day dealing with annoying back pain has taught me a few lessons. -It doesn’t matter how in shape or out of shape you are. -It doesn’t matter what your age is. -It doesn’t matter whether you have a gym to go to or not. Beating back pain is not about “getting to a certain point” so you can start making the necessary changes. It’s about starting now with the right first steps. We all have to start in the same place. The problem with most people is nobody really knows where to start. They live their life skipping steps and chasing a pain cycle that will never stop. You can’t beat back pain with more massages, another adjustment or some cool, new hamstring stretch. After firing my own doctor almost a decade ago I was clueless as to what I needed to do first. I was already super passionate about health and fitness and I knew working out could help me but I had no idea where to start. Remember, after firing my doctor I wasted the next 4 years of my life blindly searching for what worked. I did everything the interwebz was teaching me. I did the “Yoga for Back Pain” videos, I stretched in the shower, I did more mobility drills and upped my water consumption. Nothing worked. At the end of my helpless search, I had spent thousands of dollars of my own money chasing treatments, “professionals” said I needed. Doing all the wrong things for so long actually messed me up even more. Almost to the point where I started thinking maybe surgery was my best option. Little did I know that all of this pain and suffering I was dealing with was caused by simply skipping the most important fundamental steps. As a back pain sufferer, you have your own personal pain cycle. Nobody else can break this cycle other than you. This is what makes your situation so unique. This pain cycle is fueled by the way we sit, stand, bend, tie our shoes, brush your teeth, shovel snow, lift boxes, bags, lumber etc. It includes everything you do from the moment you wake up to the minute you go to bed. If you’re not careful your daily life could be the sole reason you experience so much pain. 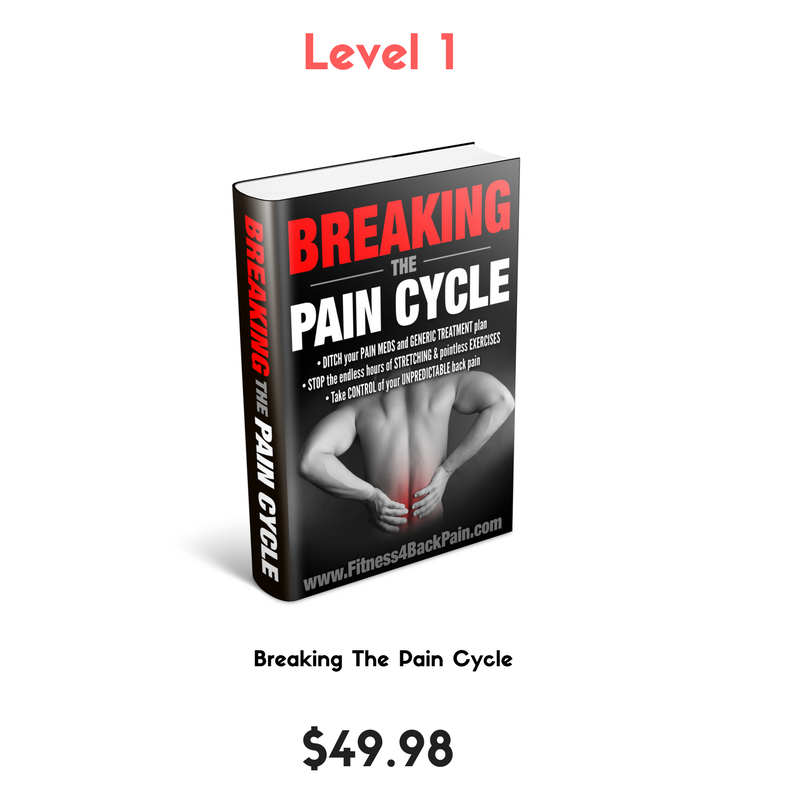 Breaking the Pain Cycle was designed for the sufferer who is tired of the endless use of stretches, chiropractic adjustments, generic PT programs along with the procedures and medications they get from their doctor that never bring real relief. It’s been designed and tested on numerous categories of back pain suffers. From fusions, microdiscectomy’s, disc herniations, disc ruptures, degenerative disc disease, slipped discs and even “un-diagnosed” back pain. It was designed for those dealing with lower back pain who want to beat their back pain on their own but have no idea where to begin. It was designed for those who fear doing the wrong thing and want to confidently and safely take the right first steps towards getting long-term relief. The program is designed to bring your current rehab plan to a screeching halt and do a complete audit of your active life. It’s not just about what you do at work, at home on the weekends or in the gym. Treating back pain goes so much deeper than picking out a few stretches to help with what you think is tight. Instead of randomly trying “new things” take confident steps towards long term relief but most importantly get rid of the fear behind finally taking action on your own. As a back pain sufferer, you are at the mercy of your doctor to show you how to get the relief you want. Unfortunately, most people get shuffled through the “medical system” and end up on operating tables. You need a way out, a way of breaking the cycle that keeps all other treatments from working to their full potential. You see, the “pain cycle” is this track that goes around and around regardless of what you stretch, what you strengthen, swallow, drink or stop. It follows you around everywhere you go waiting for you to repeat the same things you do every day. This same pain cycle is what keeps your lower back inflamed, your muscles spasming and keeps you guessing as to when your next flare up will be. Most of us think we have to wait for when we head to the gym or pick up our prescription to start working on whatever it is we think is causing our back pain. If you’re anything like the rest of Americans dealing with back pain, your doctor has probably insisted you stay active and that you’ve been “cleared for exercise”. That’s great news for anyone post surgery but terrible news if you still don’t have a fat clue as to WHY your back started hurting in the first place. What exactly will Breaking the Pain Cycle do for me? There is a reason why your back pain is so inconsistent: Learn step-by-step exactly how to audit your own life to pin point the exact areas that need the most attention without relying on doctors and other “professionals” to give you generic plans. There is a reason why the stretches your doctor gave you aren’t working: Move away from the generic print-off exercises your doctor gave you. Learn step-by-step how to address the things doctors don’t have the time to teach you. There is a reason why even with exercise your back continues to hurt and vary in severity: Understand exactly why trying “random” stretches and exercises you find on the internet may not be a good fit for you. Learn exactly what to focus on first before you spend more money and wasted time on stuff that doesn’t work. Breaking the Pain Cycle shows you how to pinpoint these key areas of your life and shed light on exactly why your pain experience is the way it is. The process used in Breaking The Pain Cycle brings stability to your unstable cycles of back pain. Thus putting control in your hands and not in the hands of surgeons and pharmacists. -Are you still dealing with back pain even after seeing specialist after specialist? -Are you constantly dealing with unpredictable flare-ups? -Does your pain get worse as the day goes on? -The Chiropractor, the PT, the Osteopath, massage therapist etc. seem to never be able to take the pain away for good? 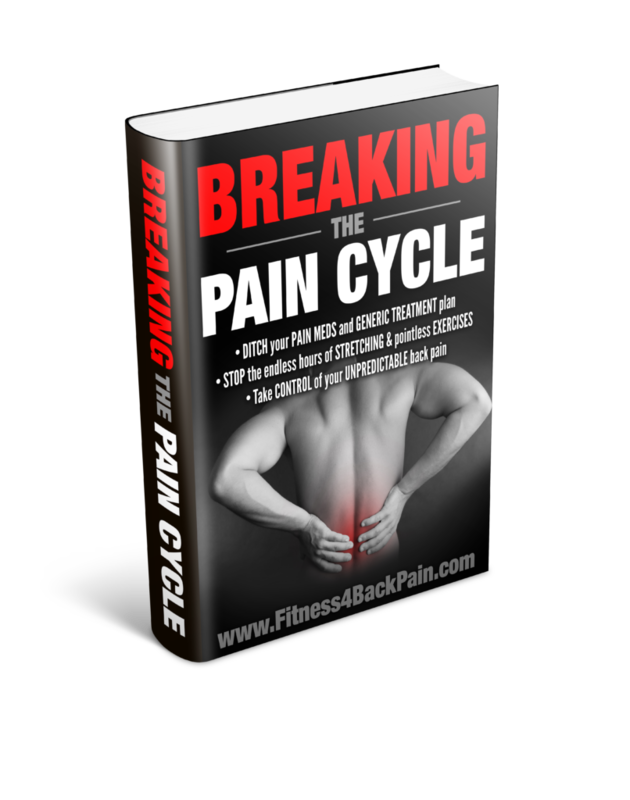 Breaking the Pain Cycle shows you step-by-step exactly how to fix the most common foundational mistakes most back pain suffers make when it comes to rehabbing their backs. From optimizing key areas such as standing habits, toxic movement mistakes, sitting habits, the way you bend and use your body for common tasks, you will learn HOW to stop the things that are destroying your chances of fully recovering from back pain. We all wish we could just read a few paragraphs and have all this great information stick. Life would be so easy and to be honest, that’s how most content is when it comes to beating back pain. A whole lot of talking but not enough doing. Breaking the Pain Cycle shows you HOW to break the habit of doing the exact things that keep you on your own personal pain cycle. The way the program is structured, you have no other choice than to start applying what you learn immediately. At the end of the day, all that matters is that you can FEEL the results. More time with your kids and family. Less money on pain killers, muscle relaxers, and doctor visits. A life you thought you could never have. I spent years and thousands of dollars out of my own pocket, trying to find someone who not only could teach me what was wrong with my back but show me step-by-step what I needed to do to see results. As simple as it was, nobody ever took the time to explain what really mattered. Before all the exercises, before all the stretches, adjustments, inversion tables and needles there is a foundational layer that can’t be skipped and I am here today to give you what it has taken me years to dumb down and figure out for myself. Where most pain suffers lose hope is when it comes time to take action. Even with all the information, they are given they still feel lost. Breaking the Pain Cycle has been structured to give you an actionable plan of exactly what you need to base your rehab around. -You’re not having to connect the dots. -You’re not having to figure out what exercises are best for you. -You’re not having to shuffle through stretches that claim to bring relief. -You’re not having worry about the doubt and fear of whether or not this is actually going to help. You will be able to record, track and progress through daily changes that will take you through what matters FIRST in your fundamental healing process. Stop googling and experimenting at the expense of your lower back. Start with what works and work your way towards finding lasting relief instead of short term fixes. Stop wasting money on chiropractors, massage therapists, trainers, or whoever else you have gone to as a last resort. They don’t have the time or knowledge base it takes to teach you the first steps to any back pain recovery plan. Doctors are quick to prescribe generic therapy plans, write scripts for pain killers and muscle relaxers and get you on the next available operating table as soon as possible. This is leaving hundreds of thousands of people just like you feeling hopeless and without direction as to WHY your back hurts and what EXACTLY you should do to finally get relief. Your doctor doesn’t have the time or knowledge to show you what really works when it comes to the fundamentals of beating back pain, it’s just not what they are trained to do. What I want to give you is the confidence that what you’re doing will get you relief but not only that, I want you to have the blueprint your back and body needs to see LONG LASTING RELIEF. Case Study and Journey of Ricky. Someone just like you who was able to break his own pain cycle! That’s pressure. I never wanted to be looked at as some back pain magician (because I am not nor will I ever be). I just want to show people they have different options. Luckily Ricky found me through a video I had published and decided to reach out. His story is very common. He is a hard working 30+ year old who has bills to pay and not enough money to keep throwing at symptoms. He wakes up with back pain, fights it all day and falls to sleep with it too. He needed something that would actually work. His medical treatment history looked extremely similar to my own. He had tried everything and the last things he heard from his doctor was that it was time to operate. 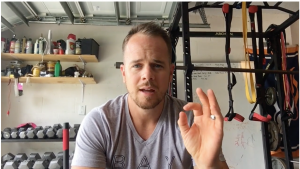 After a few weeks of dialing in a lot of common mistakes most back pain suffers make and inputting a plan of action, Ricky hit the ground running, putting to work everything we talked about. He didn’t know this at the time but he was a part of something that would change so many other lives other than his own. After a few more weeks this email pops up in my inbox. Everyone’s level of pain is different. Everyone’s reason for their back pain is different but one thing will always remain a constant no matter who you are. Mastering the fundamentals first is the first step you have to take before anything else can work to its full potential. Ricky continues to work ungodly amounts of hours building houses and working on his own projects while continuing to progress with his own pain management. The day I contacted William, I just got back from seeing a Dr. In NYC .I spent $600 just to have him review my images and read my reports. He then diagnosed me with having to need a 2 level fusion. Do your self a favor and watch a video on spinal fusions, no thank you. The recovery is forever and your never yourself after. I was researching and trying different things to try to get cured. Chiropractic, stem cell, prp, epidurals,acupuncture, massage. Everything brings some relief but nothing consistent. With zero hope I came across Williams videos on you tube and I said I got nothing to lose. I shot him a email and in the subject said, your my last hope. Honestly if I never did this I would have gotten surgery. He sent me a email back 4x longer then the one I sent him and already I felt very comfortable with beginning this journey with him. He explained very clearly that this will not work over night and that I need to trust him and he guaranteed it will work. I’m thinking to myself what is he going to tell me that I don’t already know. I was already taking it easy in the gym, at work and it was affecting my life in general. I was working my core so much I figured its weak. Then I would feel worse then I did before. Then he said zero gym. Nothing at all unless I wasn’t too go there and stretch. At first I was like noooo. But he was very thorough with his responses and I had to trust him. We made all types of changes. From the shoes I wore to the way I sleep to the way I bend and the way I stood. I would watch his videos at least 10 times each to embed it in my brain until it felt correct. I would email him specific details on what I was feeling and he would either correct me or knock time off the exercise. This was no race and I’m a very impatient person. There is nothing special about Ricky’s situation that would give my method the upper hand. He works harder than most people I know and is a gym veteran. I was more afraid of him sticking to it than whether or not it would actually work. My vision for this course is to be able to flood my inbox with testimonials of how back pain sufferers lives are being changed. I want to give people what I prayed for years to get but never did until I put it together for myself. Whether you’re dealing with an acute flare up or chronic lower back pain. The only way to prevent it from happening again or finding lasting relief is to break the cycle you’re on. Let’s fast forward a few months from now. What could happen if you do invest in the course? When you deal with chronic pain for so long even the slightest bit of relief makes a world of a difference. I know this because month after month after implementing these exact things into my own daily life, I started to notice a difference. The tightness in my lower back started to release. The chronic ache I would experience no matter if I was sitting or standing started to go away. My body actually felt like it was healing. I wasn’t just living from one stretching session to the next. The relief stuck around. Not the feeling you get when the pain meds kick in. I’m talking about real relief. I’ll be completely honest. It didn’t just disappear after doing these fundamentals for a few days. It took time. But month after month I was able to confidently say that I was getting better. Anyone dealing with lower back pain dreams of the day where they can say they are truly “getting better”. I want you to give your body the opportunity to respond to something other than steroid injections, adjustments and pain meds. I want to show you the first steps to getting real relief. The information in this course isn’t a bunch of feel good, mindset bull crap. It’s actionable steps to feeling better. You will take this stuff with you for the rest of your life. What could happen if you don’t invest in the course? If you choose to pass on this opportunity, I understand your skepticism, I really do. As a matter of fact, I passed on opportunities like this all the time. Which is why I dealt with chronic back pain for over 4 years without any progress. A one-time investment in yourself could save you thousands of dollars down the road. A couple years ago I was seeing a “Sports Chiropractor” that I was paying for out of pocket. Nothing he did for me gave me lasting relief nor did he ever teach me how to continue to improve session to session. He would adjust me, do a little Graston and send me home. I felt like every session we did together he would withhold just enough information to keep me on the edge of my seat and back the next day. I hated that feeling but I trusted him. $900+ dollars later I gave up and started doing what I have found to really work. 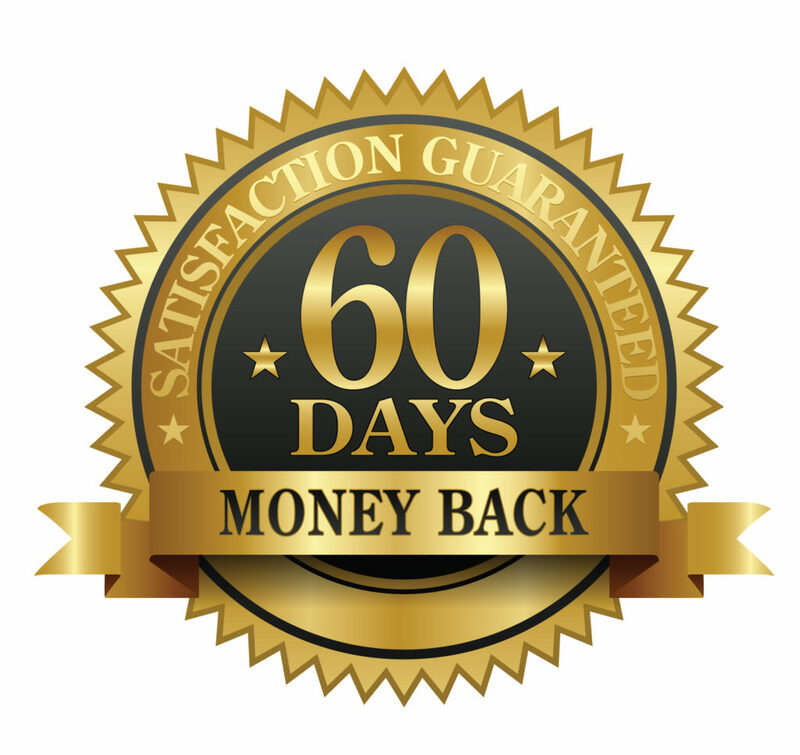 I have been able to compile the most fundamental steps back pain suffers must take and I am giving it to you for a fraction of the cost. If you choose to pass on this course I can confidently say that you will be in the same amount of pain if not more than what you are in now months from today. You’re going to close out of this screen and do more searching around trying to find that one stretch or class you can take to bring relief to your lower back pain. You will continue to skip steps and follow mainstream treatments until you’re popping more pain meds or face down on an operating table. I only say this because I went down the same road. I am just more hard-headed and would rather hide the fact I’m in pain than face it head on than deal with the issue. When I was at the peak of my pain, I not only refused surgery and shots, I refused any outside help, even from people I “trusted”. If what you have been doing has not gotten you relief why continue doing it? You’re going around the same mountain expecting something different every time. Let me help you put an end to your pain cycle. **Attention**: Once your purchase is cleared, you will be sent the downloadable PDF’s. These are not physical items that are sent to you in the mail. You will get INSTANT ACCESS to the products. From there you can save them to whatever platform you use. This mini-course covers the 6 most important steps to stepping into the gym when you’re dealing with back pain. Not only that but I give you an insider’s look at how I design all of my own workouts along with my clients that are trying to still live an active life and recover at the same time. During the entire time I was putting this system together I was constantly thinking about me as a consumer. Every decision I made and piece of content I put in or took out, was based on what would bring the most value possible. If there is anything I wanted you to know is this course was not created by some medical facility or someone who has never had to deal with real back pain. I lived with back pain for over 6 years, 4 of them spinning my wheels and chasing failed treatments. I have been in the fitness industry for over 10 years where I have put my education in Exercise Science and Human Movement to work. Not only that, I lived through what you are going through now. To this day I make decisions daily that will either bring pain or relief to my own back. I owe the comfort I can live with every day to my dedication to you, the back pain sufferer and relentless pursuit for answers that the medical industry fails to provide. I want to offer you the best first step you could take to beating your own back pain without the use of doctors or drugs.